Yet another achievement tracker? Hopefully not. There are real cool addons tracking favored and well-known achievements already. The goal of this addon is a bit different. 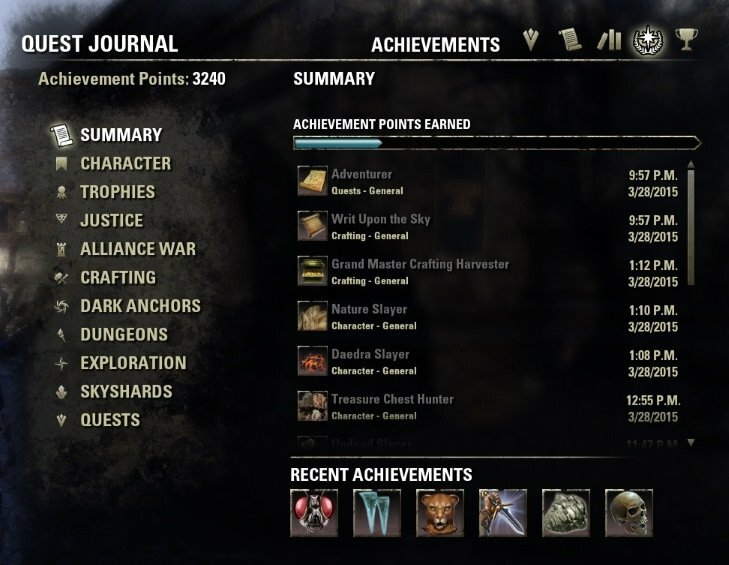 If you go to the build-in achievements window, you are interested in achievements related to things you did recently. After finding a rare throphy you ask yourself "Did that count for something?" Normally you go to the build-in achievements window and give up after one minute of expanding and scrolling up and down. 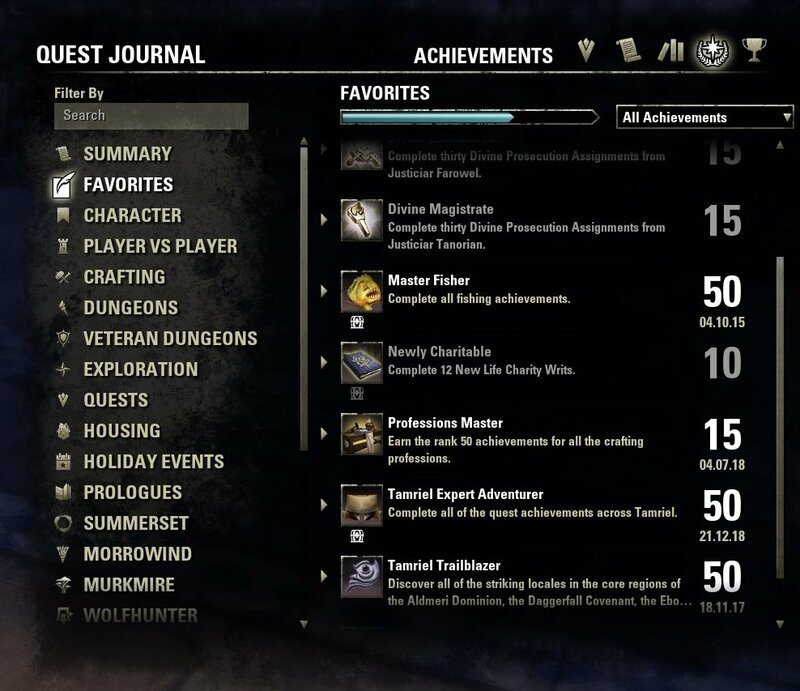 This addon replaces the achievement overview with a list of recent updated achievements. It shows you the name of the achievement, update date and the origin category. If you hover one, you get detailed information about the progress. That's all you wanted in that moment. And if double-clicking it, the right category is opened for you. There you get more information may introduced by other addons. 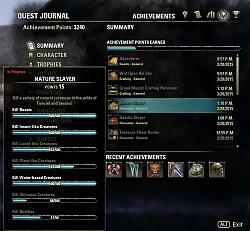 After first time loading for a character, the list is filled with started achievements, not necessarily recent. But if you go and play, the list gets accurate quickly. Noch so ein Achievement Tracker? Ich hoffe nicht. Es gibt bereits coole Addons, die bevorzugte und bekannte Errungenschaften tracken. Der Ansatz von diesem Addon ist etwas anders. Wenn man zur Seite der Errungenschaften geht, ist man an Errungenschaften interessiert, die zu Dingen gehören, die man kürzlich getan hat. Nachdem man eine seltene Trophäe gefunden hat, fragt man sich "Zählt die für was?" Normalerweise geht man dann zur Seite der Errungenschaften und gibt nach einer Minute aufklappen und rauf- und runter scrollen auf. Dieses Addon ersetzt die Übersicht der Errungenschaften mit einer Liste kürzlich aktualisierter Errungenschaften. Die Liste zeigt den Namen der Errungenschaft, das Aktualisierungsdatum und die ursprüngliche Kategorie. Wenn man mit der Maus über ein Eintrag geht, erhält man Details zum Fortschritt. Mehr wollte man in dem Moment auch nicht. Und wenn man ein Eintrag doppelklickt, wird die richtige Kategorie geöffnet und man erhält dort weitere Information, die eventuell von anderen Addons kommt. Beim ersten Mal Laden eines Characters wird die Liste mit, nicht unbedingt kürzlich, begonnenen Errungenschaften gefüllt. Aber wenn Ihr loszieht und spielt, wird die Liste sehr schnell genau. - Allow to track favorited achievements. I added it as an extension. If you have trouble the other achievement addons, you can disable it. - Update to API 100025 "Murkmire". - Update to LibCustomMenu rev. 6.5. - Update to LibCustomMenu rev 6.2. - Fixed opening achievement did not work right anymore. - Added context menu for summary with "Link to chat". - Show original summary as tooltip for category headers. Also adding a sub-category summary. - Fixed in-game bug of "General" sub-category progress-bar showing summary points. - fixed missing formatting in tooltip. - Additional faulty API data check reported by manavortex. - Cleanup list for completed achievements. 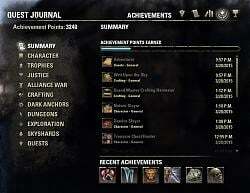 - ESO 2.6 'One Tamriel' ready. - API bump 100016: ESO 2.5 (Shadow of the Hist) ready. where can I find the settings for the favorites? I don't see them within the extensions. There are no settings. Right-Click any achievement to add it to the Favorites. Afterwards it is in the "Favorites" category. Maybe add tracking like Wykkyd tacker does. What do you think: Should tracking be account-wide or per-character? Does this count furniture collected for the furniture placement achievement? Good question. I have a look. May not exactly, but I got some ideas. I have some ideas for new features/improvements. 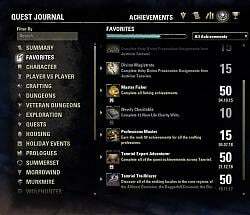 1) Ability to sort the window contents by, let's say, finished state (I know you can filter that, but maybe someone might want to keep everything in the window), reward (I'd like to see achievements that give a dye first for example), and name (so related achievements are grouped together). 2) Bug? 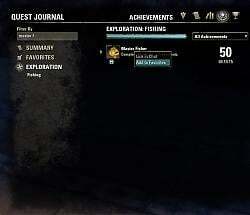 Filtering only earned achievements includes those that are in progress. If this is intended, I suggest adding third option "in progress". Well, both are not subject of this addon. votan, do you have any plans for the filtering feature? I just verified that this addon is still working: Mer Achievement Filters. I did not plan this so far. 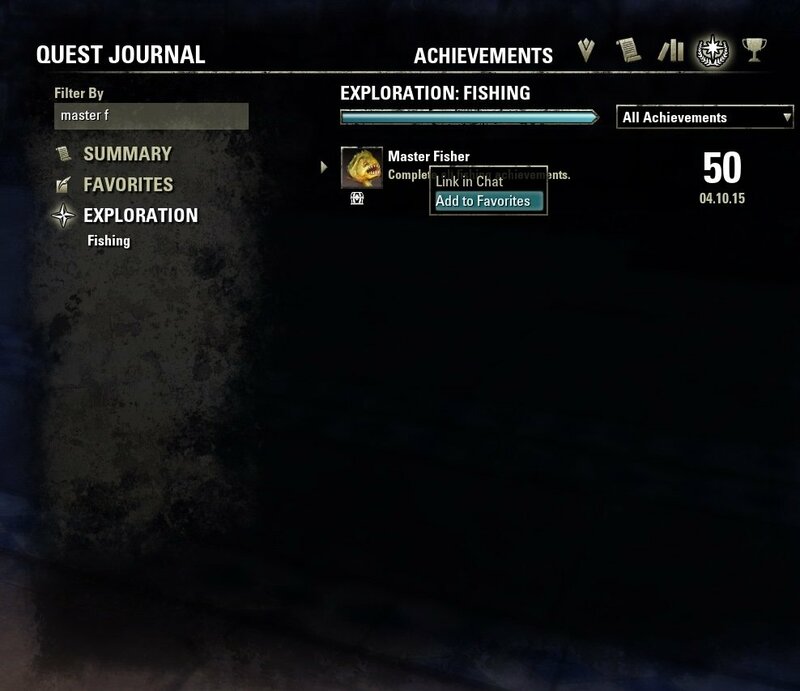 Another thing: I had Explorer achievement progress, but it's not showing in the summary. I have a small feature/tweak request. When you doubleclick an achievement from the summary window, could you not only open that particular achievement's category, but also expand the achievement itself?